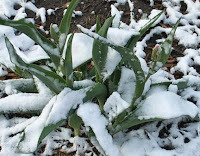 QC Garden: April snow showers bring.. I think this year I’m going to be blessed with the ugliest blooming tulips ever. Snow on top of the bitter temps a few days ago have made all new growth MUSH. This only confirms my belief that a rock garden is the way to go. Rocks look good despite whatever the weather is and the bunnies have a hard time chewing them down. The only “dirt” I’ve been able to play with is contained in a jiffy pellet. Break out the champaign, seedlings have set their second set of leaves. Woohoo! If I wasn’t still wrapping myself in blankets I might really think it was spring. The only seeds I haven’t been able to germinate is Dandy’s Lions Tail. 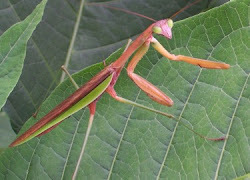 :( Bummer, I had a tail theme going on with the bunny’s tail grass, donkeys tail.. and all the other tails that wander my garden. Oh my gosh I’ve gotten inspired to write more poetry for the Dear Harley, Dear Harley poem. It’s John Prine Does it to me all the time. Enjoy the snow everyone. It will probably be 90 degrees soon.